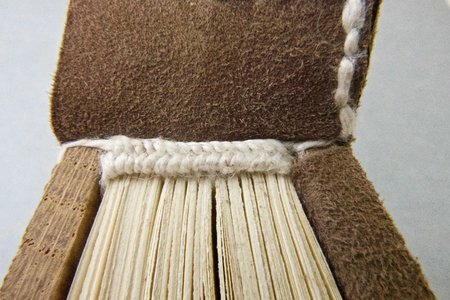 One of the main challenges in conservation is how to adapt the treatment of an item to the storage conditions in which it will later be stored. 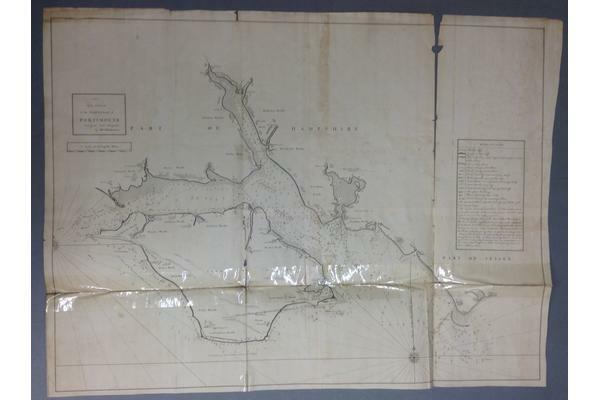 Recently I have been working on a map from the Admiralty Library - Naval Historical Branch, dating back to the 1760s (see Fig 1). The date and the name of the mapmaker; Murdoch Mackenzie, a major figure in the history of British mapmaking, were written in iron gall ink at the back of the map. The ink was analysed first. The analysis revealed that it was iron gall ink. The ink was tested using the iron gall ink test strips (bathophenanthroline indicator paper), which turns pink when iron (II) ions are detected. Iron (II) ions are water soluble and can migrate to other areas in the paper, accelerating the degradation process. 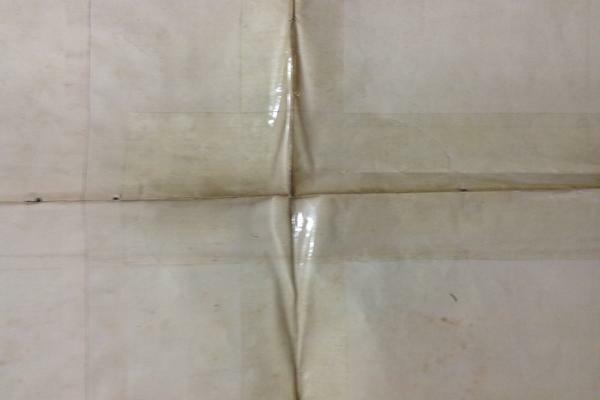 The strip was slightly wetted with water, then placed on an area with ink, and left there for a few seconds. The test strip did turn pink, confirming that iron (II) ions were present. 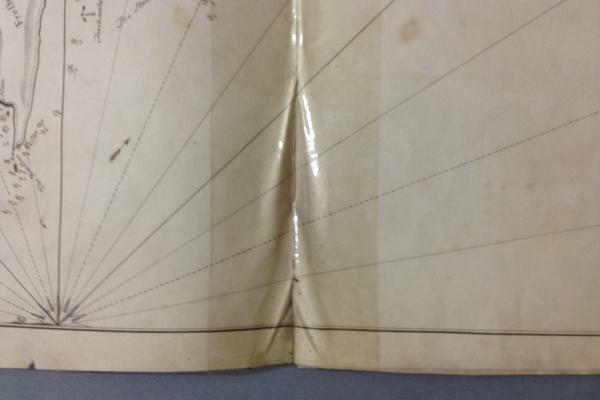 The map was in six pieces, held together by pressure sensitive tape. 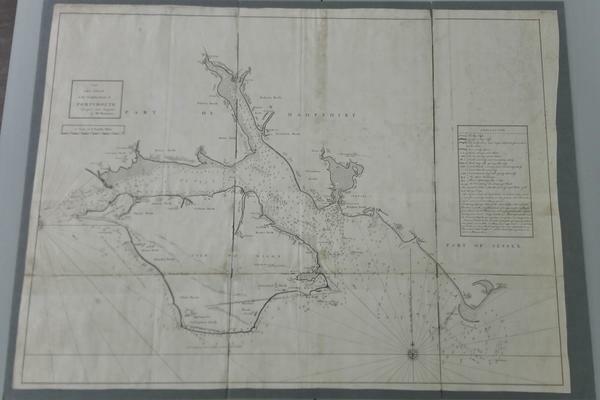 The tape was adhered roughly, exerting pressure on certain areas of the map (see Fig 2 and 3), to the point where the map could not be opened properly without causing further damage; therefore it had to be removed. The tape was successfully removed using a heated spatula, which softened the adhesive and therefore allowing the carrier layer to be removed. A stainless steel spatula was used to carefully lift the tape, ensuring that the paper was not abraded or split during the process. Excess adhesive from the tape was removed using a Staedtler® eraser. 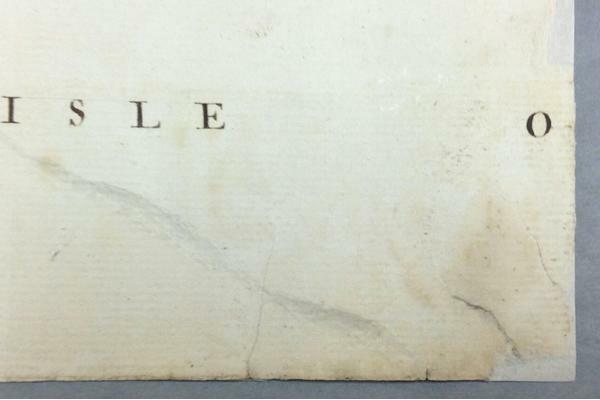 The separate map pieces were flattened under weights and left for a month. No moisture was used in the flattening process. Small tears and missing areas were repaired using cold gelatine adhesive (type B gelatine) at 5%, and Japanese tissue (see Fig 4, 5, and 6). Gelatine is an organic adhesive which is known to be used when treating iron gall ink, as it encapsulates the iron (II) ions, preventing them from migrating any further. 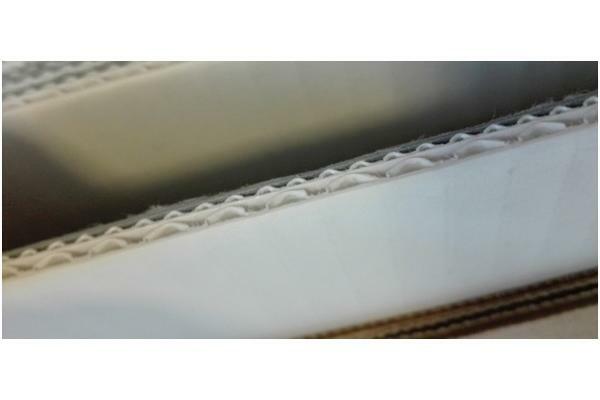 Cold gelatine adhesive is cold gelatine sieved into a horse hair sieve repeatedly to create a fine granular gel which can be broken down further when applied with a brush. 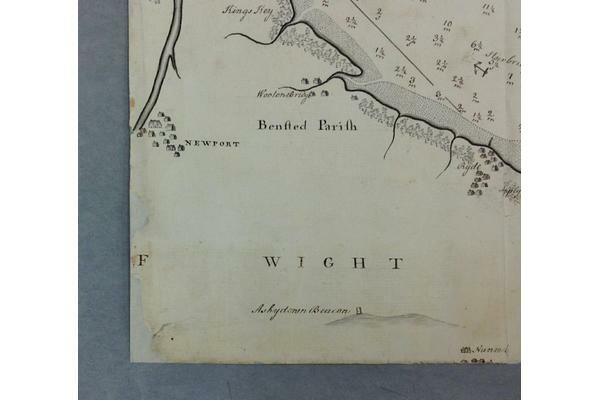 The Librarian at the Admiralty Library expressed the importance of this map and stated that it was often consulted by scholars and displayed. 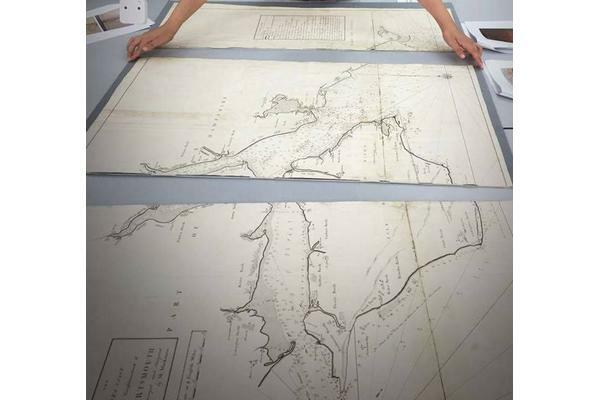 The Librarian also explained that if the pieces of the map were to be put together, storing the map flat would be impossible as their largest available flat storage space is only 120cm x 85cm, while the map measures 120cm x 97cm. Therefore the map would have to be folded. A treatment decision had to be made taking these points into consideration. 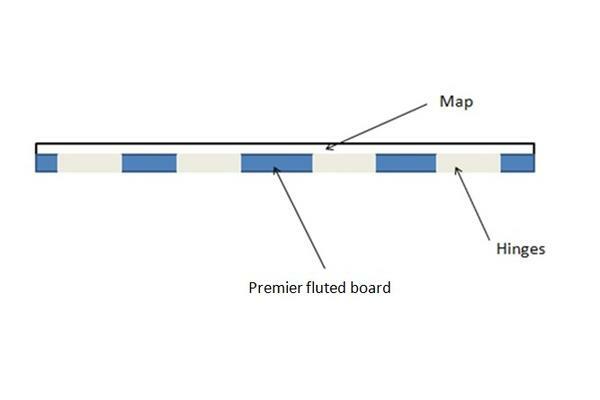 Hinging the map together was not the ideal option, because if the map is folded and opened, the joint will not only break, but might also cause pressure on the paper where the joint is attached, possibly abrading or even tearing the paper. 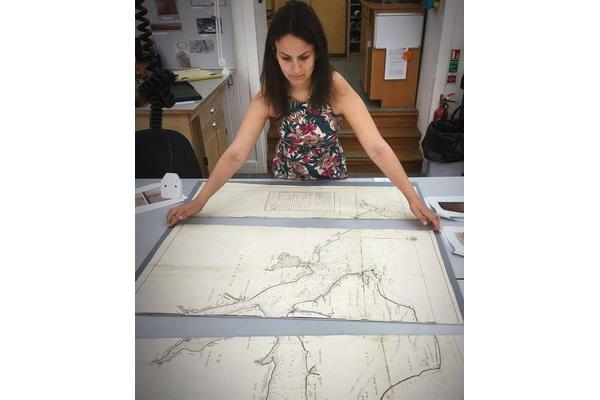 It was decided that the map pieces are to be separately mounted on to archival Premier fluted board by Conservation by Design (corrugated board covered with Conservation by Design Heritage Archival pHotokraft™ paper)(see Fig 7). It is a lightweight, yet strong type of board, generally used for box-making. Small Japanese tissue hinges were attached to the verso of the map and then attached to the back of the boxboards  (see Fig 8). This will make it easier to store the map without having to fold it. It also makes it possible to display it as a whole, by putting the pieces next to one another. 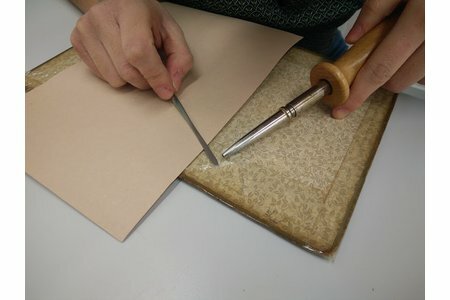 Another advantage to this method is that less adhesive and other materials will be applied to the paper, therefore decreasing the chance if ions migrating. 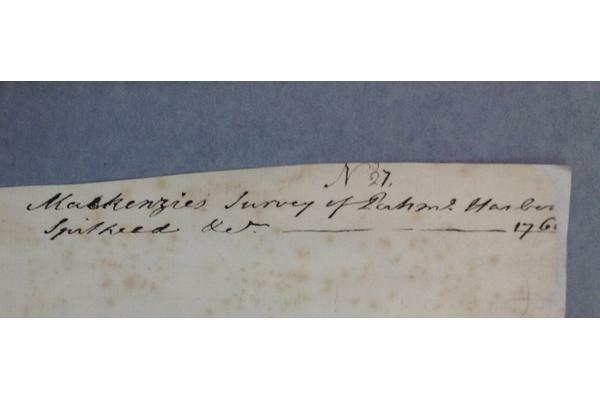 A disadvantage of this treatment is that the writings on the back (see Fig 9 and 10) will be covered due to the boxboards. 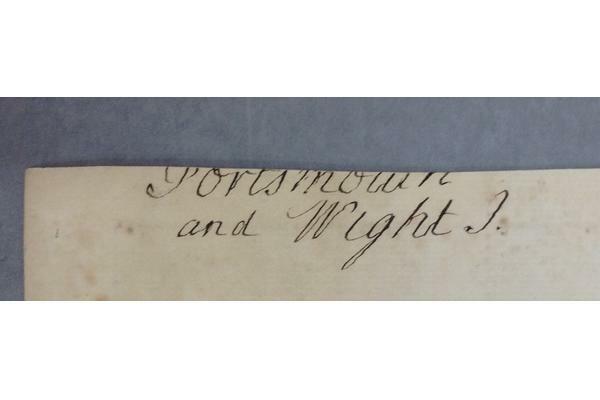 This was addressed by taking clear pictures of the text, and adhering the pictures to the back of the boards, making the information available to anyone who wishes to read or study it. It is important to note that the map can be easily detached from the boards, as the adhesive being used (cold gelatine gel) is water soluble. Excess board was left to create a border for the map when displayed flat. 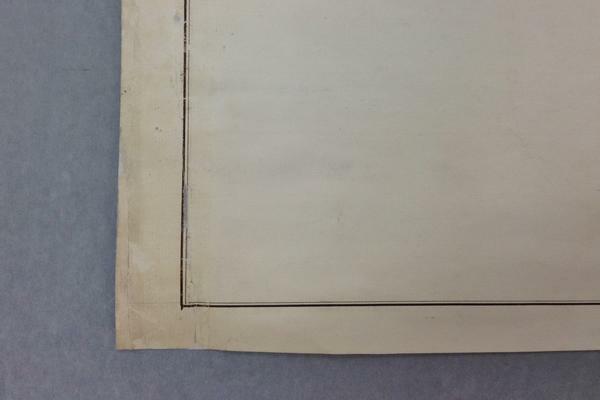 In the areas where the hinges attached to the verso of the map did not reach the edge of the board (and therefore, could not be simply attached to the verso of the fluted board), slits were made in the fluted box board, and the hinges slotted through. The slotted hinges were then adhered to the verso of the fluted board. 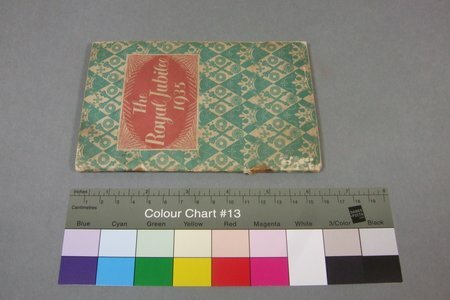 A four flap folder was made to hold the pieces together, bearing in mind the storage measurements. This treatment has taught me a valuable lesson with regards to the importance of communicating with the people who will be caring for the object post-treatment and finding a compromise between the storage conditions to which the object will return to and the treatment applied. Choosing the wrong treatment could increase the possibility of damaging the object further.